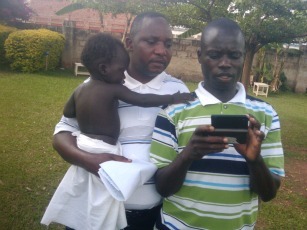 More than three years ago, I landed in Uganda to establish Grameen Foundation’s “Application Laboratory” – a program conceived to explore the potential of mobile phones to improve the lives of the poor. In our quest to test, develop and expand mobile services that are useful for the most often-ignored people on the planet, our team spent (and spends) extensive time talking to our users, in the places they work and live, to hear about the good and the bad of the methods we are testing to empower them. We sit under the mango tree at the rural health clinic, hearing about how people learn to avoid and treat common and devastating diseases like malaria and HIV. We walk the banana plantations of farmers in the West, trying to gauge how they can best control banana wilt, using locally available resources and techniques. We observe the effects of the rapidly growing “mobile money” phenomenon – essentially digital currency delivered through a mobile phone network – and assess how it can improve the lives of villagers. We see how people interact with the Internet and other unfamiliar services available through the few laptops and smartphones in a community. And we listen to farming groups, led by Community Knowledge Workers (CKWs), as they plan and prepare to bulk their crops for sale to the highest-paying buyers. As white winter washes over the US, and the rains wind down and planting season approaches in Uganda, we share some lessons learned through this work in the hopes that our growing body of work, as well as that of other practitioners in this field, will benefit. In AppLab’s early work, we tested a number of information services, leading up to our launch, with MTN (one of the primary mobile phone services providers in east Africa) and Google, of Google SMS Tips, the product that won the award for “Best use of Mobile for Social and Economic Development” at the 2010 GSM Mobile World Congress. It was rewarding to sit on a farm and hear how making organic pesticides using local chemicals or even waste products found on the farm helped save a farmer money, and increase her yields and incomes. Community Knowledge Workers act as valuable local intermediaries, bridging the "last kilometer" to bring essential information to other rural farmers in Uganda. 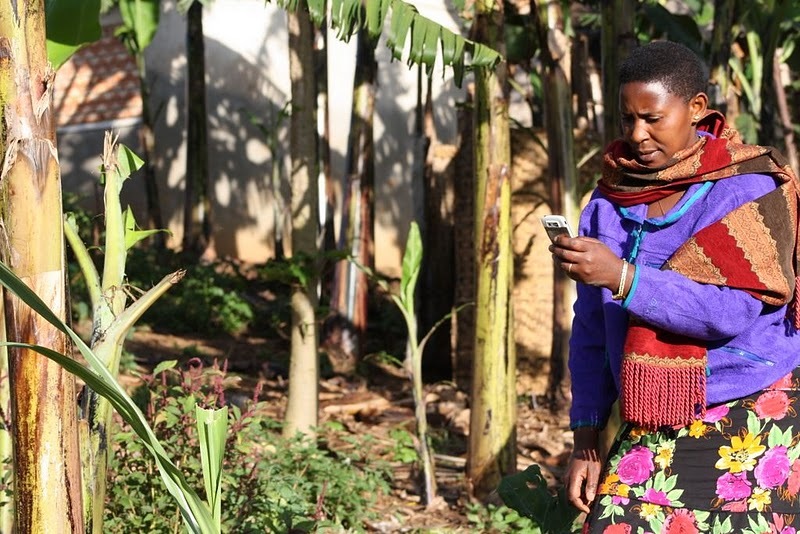 Here, a CKW uses her high-end mobile phone to check for information on banana wilt. But what became quickly apparent was that information alone is not a complete solution. A reference pointer or a tip about maternal health techniques may be useful to an expectant mother, but creating deep, impactful behavior change – what information-driven development initiatives seek – requires a context in which that information has a value. People certainly have a hunger for knowledge and a willingness to embrace the mobile phone to search for answers, as shown by all the questions they asked from the beginning about family planning, and HIV and other sexually transmitted infections, which affect them directly and for which few reliable, anonymous sources are available. But we require several things to make this information actionable and impactful: specific information, a context in which to make it useful, and relevant services and resources.